The Eastern Market 2025 Strategy is a development framework plan designed to protect the authenticity and diversity of Detroit’s Eastern Market. The resulting document is an inclusive guide for the growth of the 125-year old wholesale market that attracts over two million visitors a year. The strategy is built upon the consensus of a diverse group of stakeholders that characterize the market: large scale food wholesalers, family-owned farms that cater to the market, brick and mortar retailers, and entrepreneurs that make up the informal economy. The market is a source of both endless variety and living wages to people not only from Detroit, but across the Midwest. The document is unique in that it not only illustrates an economically sound and equitable future, but it also documents the culture and vitality of the market that must be maintained. Throughout the strategy document, photographs of and quotations from market vendors and regular customers capture the authentic character of Eastern Market. The result is a spirited plan focused on job growth and the authenticity of the local food economy. 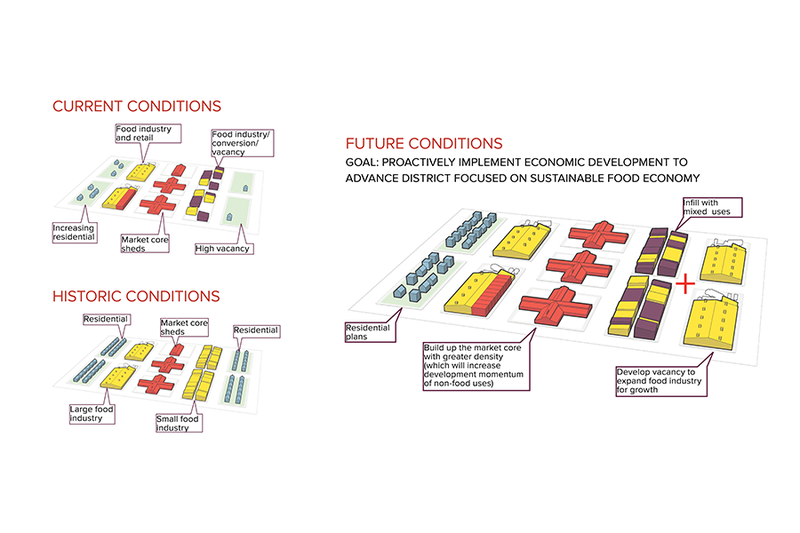 The plan lays out a vision in which Eastern Market can simultaneously expand the wholesale food industry while working to diversify the current market district by infilling with food retail and residential in ways that fulfill Eastern Market’s role as a place that welcomes all Detroiters.